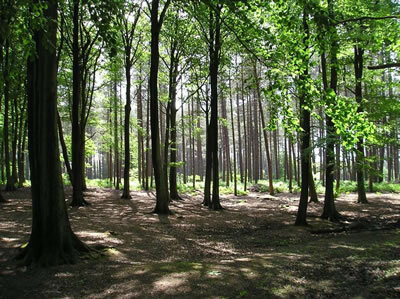 Delamere Forest is situated in Cheshire, just ten miles from the historic city of Chester. The 950 hectares of dense green forest, made up of mixed deciduous and evergreen trees, are a haven for walkers, runners and cyclists. Unusually for a forest, Delamere has its own railway station, on the line between Chester and Manchester, so it’s really easy to reach without a car. From the visitor centre, just a stone’s throw from the train station, you can pick up a map showing walking and cycling routes in the forest. The routes are also clearly labelled throughout the forest, with the dry sandstone pathways marking the way and mature trees lining the routes. For a quick and gentle walk, try the Linmere Trail, which starts at the Delamere Visitor Centre and follows the green markers. For a slightly longer walk, the red markers signpost the Blakemere Trail and should take most people just over an hour to complete the 2.7 mile route. My recommended walk would be to Old Pale Hill. From Delamere Station, head to the Visitor Centre and go past it on your right, then on to the Old Pale Hill car park. From here, the 4.5-mile route is well signposted along a wide stone track. If you want to bring a picnic there are a number of benches dotted along the way. From the top of the hill, there are some stunning views across the Cheshire plain. On the way down, you pass through meadows to Eddisbury Lodge and then back to Delamere Forest and the train station. 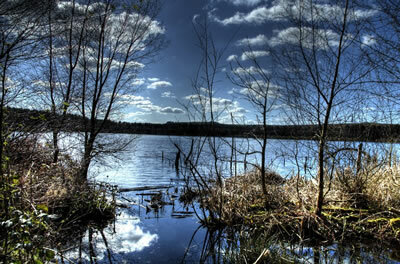 Delamere Forest is a lovely place to visit at any time. The look, feel and smell of the forest changes with the seasons, so there is always something new to see and experience. There really is nothing better than a brisk walk through the forest on cold, crisp winter’s day! Part of the station building at Delamere Station has been converted into a fantastic café, serving hot and cold food as well as delicious cakes, which are best enjoyed in the outdoor seating area. Next door is a counter serving Snugbury’s ice cream, the perfect treat after a long walk on a summer’s day. Just down the road there is also the Delamere Cafe at the visitor centre. Is there anything else to do there? Delamere Forest isn’t just for walking. The forest is home to a number of cycling routes and there are bike hire centres near the train station and visitor centre. If you fancy climbing across rope bridges and whizzing down zip wires, there is a ‘Go Ape’ course. And every summer Delamere Forest hosts a number of outdoor concerts: check out the forest website for more information. Looking to take a trip to Delamere Forest? There is a wealth of great quality holiday accommodation in the local area. Delamere Forest is really easy to access from both Manchester as well as from many other towns and villages along the train line, like Mouldsworth and Cuddington. And a trip to Delamere Forest can easily be combined into a trip to the historic city of Chester. Check out Sykes Cottages for holiday cottages and apartments in Chester and the surrounding villages. Delamere is really easy to reach without a car. Save yourself money and avoid travelling at busy periods by choosing to travel off peak. You can usually get a discount for a group booking or if you have a Railcard. For more information on train times and prices visit The Train Line.